The farms that work with Fresco Flowers are from Kenya. With a well suited high altitude climate and constantly twelve hours of sunlight per day, these countries close to the equator offer ideal conditions for growing roses. Below there’s a list of the growers whom we work with. Click on the logo of our growers for more information and click on the logo of the certification of those who have the specific certificate. As a possible grower, you can always contact us to introduce yourself. You can do this by filling out the form under Contact and sending to us. We will then contact you via email or phone. Go to the contact form. Kenya is the largest supplier of flowers to the EU. Every week 2,000 to 3,000 tons arrive at Schiphol. Cut on Wednesday, on Friday in the Netherlands already. The export value is worth about 370 million euros. The flower industry provides for approximately ninety thousand jobs, especially women. With a share of 88%, the rose, followed by the carnation (7%), is the largest product. Roses grow on approximately 2,150 hectares with an expected increase of about 100 hectares. The main production areas are: Lake Naivasha, Mt. 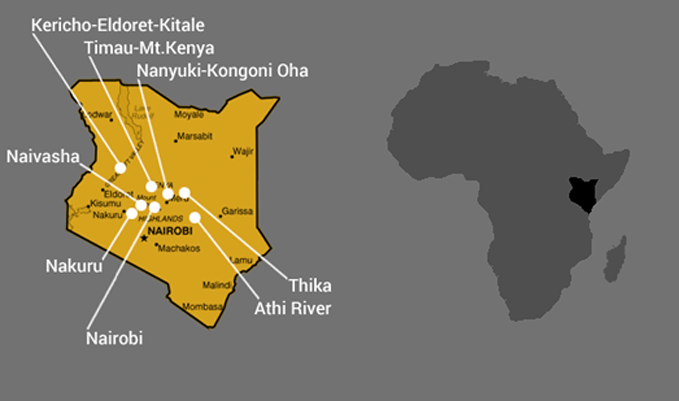 Kenya, Nairobi, Thika, Kiambu, Athi River, Kitale, Nakuru, Kericho, Nyandarua, Trans Nzoia, Uasin Gichu and Eastern Kenya. The tropical climate of Kenya is influenced by the Indian Ocean despite the fact that there are major differences. On the coast, for example, it is tropical, but on Mount Kenya the temperatures drop around the freezing point, whereas in the north it is hot and dry. Kenya has two rainy seasons (April-May and Oct-Nov-Dec) instead of four seasons and the quantity of water during rainfall varies by area.